I was lucky enough to get my hands on a pair of preview tickets to see ‘The Queen’s Coronation 1953‘ exhibition at the Palace on Friday before it’s public opening. I felt very honoured. I’ve been to Buckingham Palace before but this was something special as I would get to see the Queen’s coronation dress, I couldn’t wait. As you may have seen in a post from back in June I have got more interested in the royal family over the years and of course the fashion. It seemed only right that after all her hard work at Johnny Loves June’s fair last weekend that I took my mother-in-law along as a treat. I knew she would appreciate it and I thought it would be a really nice way to spend the afternoon together. The issue getting ready that morning was the question every fashion conscious lady asks – what to wear? I knew with the new arrival last week the royal family would be busy but you never know who you may end up seeing. I chose a scarf I have had for years by the designer Cornelia James who has a royal warrant going back to 1947. It seemed in keeping with the spirit of the afternoon. I also picked a light pink 1940s day dress as the invite had said smart casual (I didn’t want to go too mad). The exhibition is really worth a visit if you haven’t been to the palace before, especially if you love the outfits from 1953 as I do. One room had projection on a large wall space showing archive footage of the run up to the big day as well as a film of how the dress was created. There was also a really cool display of vintage style TVs all showing old footage simultaneously. One of the films was all about hats! They also had a BBC camera that was used on that very day in 1953. The footage of the coronation was shown in another room on a large screen. If you would like to see this for yourself you should get the DVD released by Network called A Queen is Crowned which is a new restoration of the coronation day and is in full colour. It also comes with a PDF of the original programme which is very cool. Then came the main point of the day ‘The Coronation Dress’. It’s hard to relay just how amazing it really is. In all the pictures I have seen of it I never knew it had small embroidery of flowers all around it. The colours are light green and pinks, it is so pretty but must have been very heavy to wear. 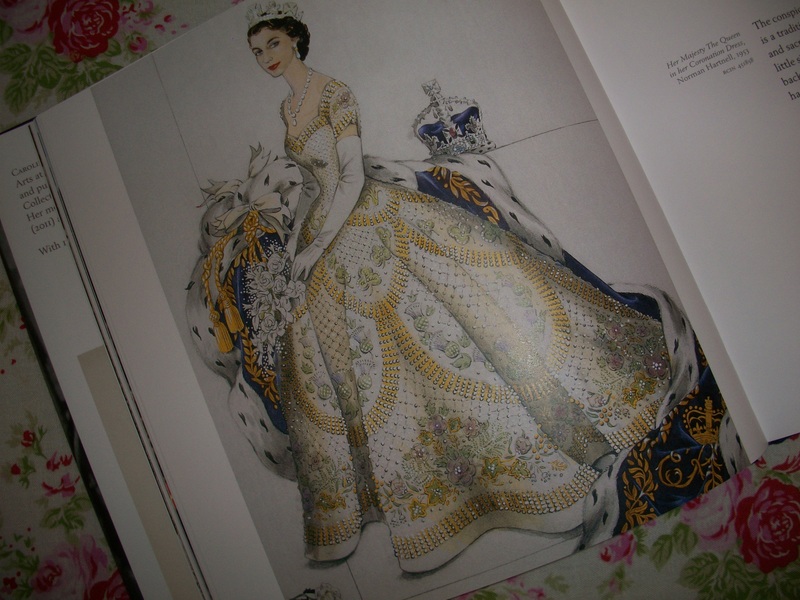 The work which went into the dress from the direction given by the Queen herself, the designer Norman Hartnell and the people who spent hours embroidering it is amazing and it still looks new in 2013. I have also never noticed the small capped sleeves before, really sweet. Other pieces I liked was the samples of the embroidery on display and the sketches of the dress itself. The dresses worn by the the Maids of Honour are a rich gold colour but in all the photos look white, that was interesting. Again the embroidering on these were beautiful. Prince Charles and Princess Anne’s outfits can also been seen and not only are they tiny but you will notice the same lace was used for both outfits. There was so much more there but I hope it gives you the idea that it was worth the trip. I was also pleased that each display had signs about the pieces on each side so when it gets busy everyone will be able to read them. The space they have used is large and they have not tried to cram too much in, this is really hard to get right at exhibitions and I think they pulled it off well. Palace tea and cake – only the best! To finish the wonderful afternoon off we of course had tea and cake and a look at the grounds. As we headed back to the station and the mother-in-law confirmed she had enjoyed the afternoon I got thinking about maybe taking up embroidery…..